Saki-Hikari Goldfish Food Review – Color enhancing of the purple bag | My Goldfish Is Alive! It is very probable that you have seen the Hikari brand in most of the fish stores that you have visited. It is one of the more popular and easily accessible brands in specialty fish food. Hikari which originated from Japan has many different product series under their belt, and Saki-Hikari goldfish food series is one of them. This is a review of the Saki-Hikari Fancy Goldfish Color Enhancing product, otherwise known as the Purple Bag of this series. Saki-Hikari products focus on premium diets for goldfish. They are slightly more expensive than most brands due to the high-quality ingredients used and special formulation to target certain growths of goldfish. Their products are properly researched and tested before being put into mass production. It contains nutrients requirement of a high quality daily diet for goldfish. Above is the Guaranteed Analysis (GA) on this product label. As consumers, this information helps us to find the levels of at least four nutrients in the product: Protein, Fat, Fiber and Moisture. Saki-Hikari goldfish food product label listed more that these 4. Let’s take a look at each of them and find out why these nutrients are important in our goldfish diet. Protein is needed for growth as well as for source of energy. Younger goldfish that are growing will need around 40-60% protein in their diet, while the older ones need 30-40% of protein in their maintenance diet. This product listed its protein content as 45% or more. This means it is really good for young growing goldfish. Besides being a source of energy which are stored in the body for future use, fats or lipids are important components of cell membranes, nerve cells and hormones. Some of these fatty acids can only be acquired through food, and they should be at least 1% of the diet. The fat content of this product is at least 7.0%. Lower fiber means lower amount of poop from goldfish. Fiber is used along with protein and fats to determine the quality of a fish food. High protein, high fats and low fiber are considered to be of a higher quality than those with high fiber content. The typical range of fish food are: Crude Protein: 36-42%, Crude Fat: 6-15% and Crude Fiber: 3-5%. Anything higher than 8% for crude fiber is considered as low quality fish food. This product has the following contents: Crude Protein: at least 45%, Crude Fat: at least 7.0% and Crude Fibre: not more than 3.0%, which makes it a high quality fish food. Lower moisture content allow for fish food to be stored at room temperature for a longer period of time. 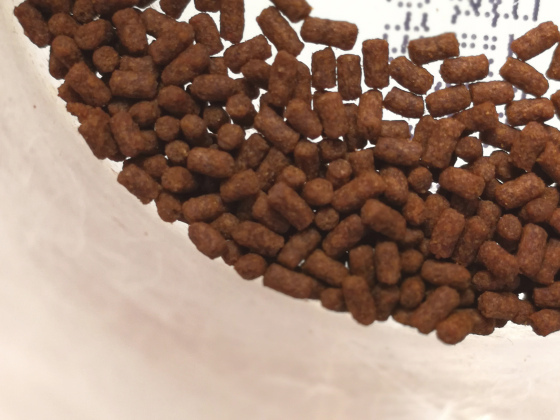 Most fish food that are available in dry pellets contain 13% moisture or less. This Saki-Hikari goldfish food product listed its moisture content as not more than 10%. Ash refers to the mineral contents such as calcium, phosphorus, potassium and magnesium in the fish food. These minerals help in bones formation, water balancing control, gas exchange, muscle activity, cell membranes, to name a few. The normal ash content of dry fish food ranges from 7% to 12%. The ash content of this product is listed as less than 20%. Phosphorus is one of the important minerals that need to be supplied via diet. Together with calcium, phosphorus work to build and repair bones, teeth and scales of the goldfish. It is also involved in metabolic processes. Deficiency of this mineral causes slow growth rate and bone deformities. This Saki-Hikari goldfish food contains 1.8% or more of phosphorus. For more information on understanding fish food label and nutrients requirement, please click here. It has color enhancing formulation. Saki-Hikari Fancy Goldfish Color Enhancing fish food product include a formulation for a perfect balance of Astaxanthin, which is a carotenoid. Carotenoids are pigments that result in the red, yellow and orange coloring on our goldfish. As goldfish cannot produce these pigments by themselves, they need to get them from the food that they eat. Astaxanthin is the red pigment and along with pure-cultured spirulina in the formulation, they work together to deepen the red tones of our goldfish without impacting the white areas. It contains Hikari Germ, the patented living probiotic. This Saki-Hikari goldfish food includes a scientifically developed living probiotic that is patented by the company. It is called the Hikari Germ which is a strain of Bacillus bacteria. When ingested by the goldfish, they multiply in the intestine and accelerates the digestive process. Besides that, these Hikari Germ are capable in reducing the bad bacteria in the intestines, thus hindering them from spreading and infecting the fish. This living probiotic also re-condition goldfish wastes into smaller particles that our tank filters can easily handle, thereby impacting the overall water quality in a good way. It includes some vitamins too! Besides Vitamin A and Vitamin D3, this product include higher levels of Vitamin E and stabilized Vitamin C as part of its formulation. These vitamins are very important to support the health of goldfish’s immune system. 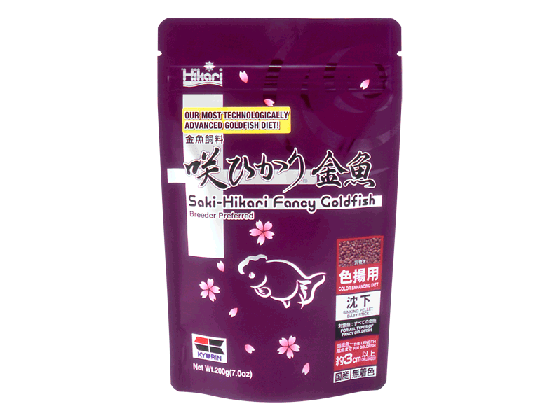 Saki-Hikari Fancy Goldfish Color Enhancing (Purple Bag) is a product that is thoroughly researched and tested specifically for goldfish. It is a color enhancing product with growth characteristic. With its high quality ingredients and nutrients composition, this Saki-Hikari goldfish food is indeed a premium daily diet for your goldfish. The downside of it could be its price as it is considered at a higher price range than most of the other brands. I guess that happens when you are getting a high quality product. I love this article! It breaks down the key nutrients required for a high-quality daily diet for goldfish. I like the way you presented and explained the four main nutrients in the product, especially with the fibre. It’s easy to understand their significance and I will definitely recommend your site to a friend of mine who also likes to keep fish and an addict towards goldfish. Thanks for the comments. All goldfish can live very long if being taken care of properly. The streamlined body ones tend to be hardier though. As for what to feed our goldfish, do check out this post of mine. This is nice. Wish I’d had it for my little fish a while back. I didn’t think about nutrition I just fed the little fishy whatever. This encourages me to care more for his life and wellbeing. Thanks. This is really great information. Thank you for explaining so much about goldfish nutrition. I got so tired of my fish dying that I haven’t had any for a while, but with the info from your website I think I’m ready to give it another try. Hopefully it will be able to help you with your fish keeping when you are ready to take it on again. Hey Alex really nice article I have got this food last week. My gold fish have shown really nice colour enhancement in just a week, and my fish love this food. I just started giving them saki hikari together with the the saki hikari red. Do i need to feed them hikari lion head since some of them are still juvies to maximize growth? I have red cap, oranda and ryukin. I noticed from the site that saki hikari series do not have the features of outstanding growth logo. Thanks. Hope you can enlighten me on this one. I always believe in feeding my goldfish a variety of food. For dry food, I have Saki Hikari Purple, Saki Hikari Green, Hikari Lionhead & Kenta for them. Besides that I feed them peas and frozen bloodworm as well. 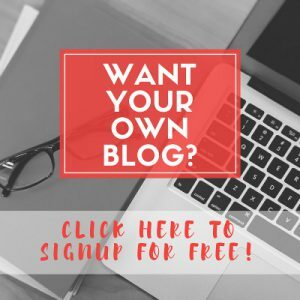 You can check out this post on what else you can feed them. As for growing goldfish, basically you just look out for food with protein content of between 40%-60%. I believe those with outstanding growth logo means that the protein content is of a higher side of that range. Anyhow, always go for variety in their food so that they can get the nutrients they need. It’s not just about getting them bigger, but also in good health.